I was at Comic Odyssey today, wondering if I should buy Daredevil #28 or not. I've been buying Mark Waid's run on Daredevil since issue #1, enticed by its more upbeat take, the fact that I generally love any Waid-written superhero, and the artists lined up for the book. Eventually as DC continued to lose me title by title, the only titles I were getting were Daredevil and whatever Dan Slott's Spider-Man book was that month (Amazing or Superior). And I'll be honest, when Daredevil started, it was getting these rave reviews, calling it the best superhero book out today, and I didn't believe it — mainly because I thought Slott's Spider-Man was better. 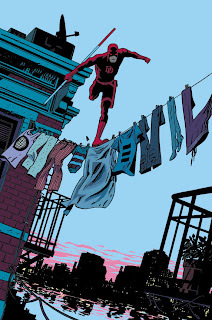 But as time went on and Waid seemed to be more and more comfortable with Daredevil, and especially when Chris Samnee came on board as the regular artist, I shifted my opinion. Sure, I was only reading two monthly superhero books, but I definitely thought Daredevil was the superior book, in terms of quality. I just did not imagine superhero books getting better than that. And that's why I decided to drop Daredevil today. See, Daredevil #27 wrapped up the last two years' worth of storylines in such a satisfying manner. Not everything was resolved — nothing ever is in an ongoing title; there's always going to be something unfinished to keep you on — but I was happy with how it ended, and I saw it as a very fitting cap to Waid's Daredevil saga. I'm about to turn 31 years old and I've been reading superhero comic books my whole life, aside from a four-year span when I went to college couldn't afford it (and that certainly plays into my situation now, when I am trying to increase my disposable income each month). I know how the game works, so to speak. 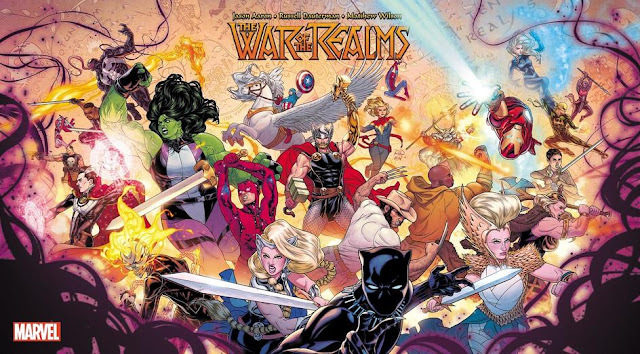 I know that it's going to keep going, that the quality will depend on the creative team (not just the writer or the artist but their synergy), that the interpretation of the characters themselves will be dependent on whichever creative team. Alan Moore and Steve Bissette and John Totleben's Swamp Thing is not the same as Alan Moore and Rick Veitch's Swamp Thing is not the same as Rick Veitch's Swamp Thing, however subtle and small those differences may be. I also know that throughout my years of collecting comics, there are many times I wish I'd dropped a book at its high point rather than see it decline. I know that definitely happened with Slott's Spider-Man — I wish I'd dropped it after Spider-Island (the time travel story that followed it was exceptional, but Spider-Island would have been the place to stop), but I kept going, even if I didn't think the succeeding stories were as good, until Superior Spider-Man happened, but even then you could make the argument that that's a completely different story, what with the different protagonist and all. I don't know why I have a full run of the 1990s Guardians of the Galaxy when I hated everything after issue 29 (the series went 62 issues). I wish I'd dropped The Silver Surfer after issue 75, or at least 82, but I kept going until 104. I have no idea why I kept collecting Spider-Man and Spectacular Spider-Man after the Clone Saga, when I didn't even like them. Maybe it's because, in the course of collecting, I still get attached to the characters. I want to see where they go, but more and more, I just value the story. I got an end to the saga in the last issue. I don't really need to embark on a new ride with the same crew right now. It feels like time for a new adventure elsewhere. I still like Daredevil, but I feel like if I'm going to jump off, it's got to be now. You know what else made it much easier to drop the title? This. Knowing that the fifth volume of the collected editions will end with #27, if I wanted to continue with Waid's Daredevil in the future, I really just have to wait for volume 6. That's a long, long way the industry has come since I was young — if I dropped a title then and then decided to catch up with it months later, I probably would have needed to hunt for it in the bins over and over again. These days? No, I just really need to wait. It's available in some other format. Hardcover, paperback — even digital. I won't be at a loss for options to get it again if I wanted to. And that's one of the great things about today, folks. Things are more available than ever. If you like the old stuff (as I do), you have options. You can get them. If you like the modern stuff, there are at least three ways for you to get them, all with different levels of expediency. It's the Digital Age. But it may as well be, for my money, another Golden Age — an age where most everything is available in some way, shape, or form. Like I said earlier, superhero comics just keep going. Stories end and then begin again. You can't expect to be wowed by everything. Sometimes you gotta know when to jump off. But it does make it easier — significantly so — knowing that when you jump off, there are many ways of getting back on. So thank you, Mark Waid, Paolo Rivera, Chris Samnee, Marcos Martin, Steve Wacker, and all of you guys who have been on Daredevil for the past two years. Please know that I would have kept the title if money weren't an issue, and that I probably would have kept it if Chris didn't take the artistic break. I've never cared so much for Matt Murdock (and Hank Pym, actually). It was a fun ride, and very enjoyable. And maybe I'll get back on in the future. Thank you. Agreed, if you need to drop a title due to financial reasons, this was a perfect spot to do so. Even though I have no reason to expect the quality to be any less with future issues, I was sad to see the story end, it was so good. It sounds like you haven't been reading Hawkeye, which is surprising. It's right up there with Daredevil and Spider-Man in terms of quality and surpasses both of them in terms of experimenting with the medium. If you get the chance, I highly recommend picking up the first Trade. I appreciate that recommendation; Hawkeye comes highly recommended. And to my point, I'm glad that we live in an age where I can say "I'll put it on my to-buy list" and feel no pressure in buying it immediately.